In the fifties and sixties, gardening was as popular as it is today. Roses were almost universally grown in fifties' and sixties' gardens. According to a "Which" report in 1968, £9,000,000 (that's £108,000,000 in today's money) was spent on roses every year and around a third of people with gardens bought rose plants. "Which" bought a selection of commonly grown roses for their report - 'Ena Harkness', 'Iceberg', 'Danse du Feu' (a climber) and 'Peace' (as a standard - a tall tree with a triangle of foliage at the top). In 1968 roses cost around 5s for a small plant from a specialist nursery and 3/6 from Woolworths. The climber was more expensive at 7/6 and the standard more so at 25s (but only 10/6 from Woolworths). To complement this web site, we experimented by growing a selection of popular varieties in our garden today. Surprisingly enough, most of the more popular roses of the era can still be bought today. We managed to buy all ours from a local garden centre. However, specialist nurseries can carry stocks of hundreds of varieties. Peter Beales, for example stocks most of the popular varieties from the fifties and sixties and they are available by mail order (visit their web site www.classicroses.co.uk). We did not have huge difficulty growing these roses, although they did seem more susceptible to disease than more modern flowers. We found the book 'The New Rose Expert' particularly useful, with advice on where to plant, how to dig the plot, what to feed the roses with and when and how to deal with problems. The fashion at the time was for large blooms. These roses are no exception. It now seems that the trend in modern roses is swinging in this direction as well. This is 'Peace', first grown in 1945, no prizes for guessing why it was so named. This rose was a firm favourite right throughout the fifties and sixties. This rose was recommended as one of the best varieties for general growing, for exhibition and for growing as a standard in "Simple Rose Growing" by A G L Hellyer (1954 edition). In 1975, leading rose expert, Harry Wheatcroft, was still recommending it in "Be Your Own Rose Expert". The flowers start off being quite bright yellow, they then fade to this lovely pale yellow and pink. 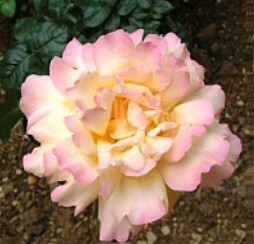 It is quite a large rose tree and grows vigorously. 'Super Star', also know as 'Tropicana' - was first grown in 1960. 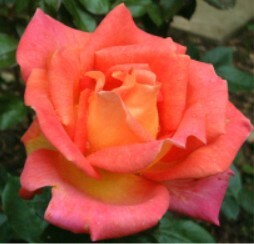 This was one of the most popular roses of the sixties and was appropriately named for the decade. Its flowers are like no other that I have seen. They almost look like they are made of porcelain. The colour is on the pink side of red. The flowers are very large and striking. 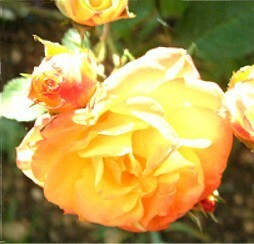 It was described by Harry Wheatcroft as "one of the greatest roses of our time". Like Peace, both the flowers and tree are large. It grows strongly. In the sixties it was resistant to disease. Our experience suggests it is less so today, but still produced some impressive blooms. 'Piccadilly, left, was first grown in 1959. It is a scarlet and yellow bi-colour flower. Contemporary literature describes the flowers as being of medium size - by today's standards, they are quite large. 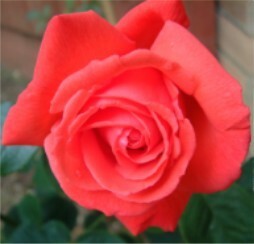 Piccadilly was a rose recommended by Harry Wheatcroft in "Be Your Own Rose Expert" (1975). This was one of the roses that my parents bought in 1964, when they moved to a new house. We found very few problems with growing this one. 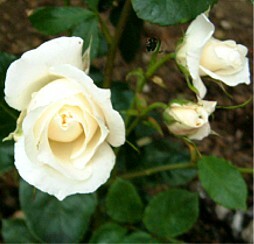 'Pascalli' was reckoned to be one of the best white roses of the sixties. It has medium sized white flowers. The flowers are smaller than the other roses on this page, but were greater in number. It was first grown in 1963. 'Whisky Mac' was introduced near the end of the sixties, in 1967. It was, however, already popular by the end of the decade. The orange colour was unusual and well liked. We found this one flowered well throughout Summer and early Autumn.